I’ve never really been one for celebrating St. Patrick’s Day. As a kid I have never had very many green clothes. I mean, I’m sure I had green clothes somewhere but they always seemed to magically disappear come March 17 and I spent the entire day trying to avoid being pinched by everyone! In college the day just became an excuse to drink green beer and run around sporting a “Kiss me I’m Irish shirt”. Oh come on.. you can’t tell me that you didn’t do the same thing! Now that I am older, St. Patrick’s Day is well, just an excuse to consume empty calories in the forms of ice cream and cake. (Thank you very much!) 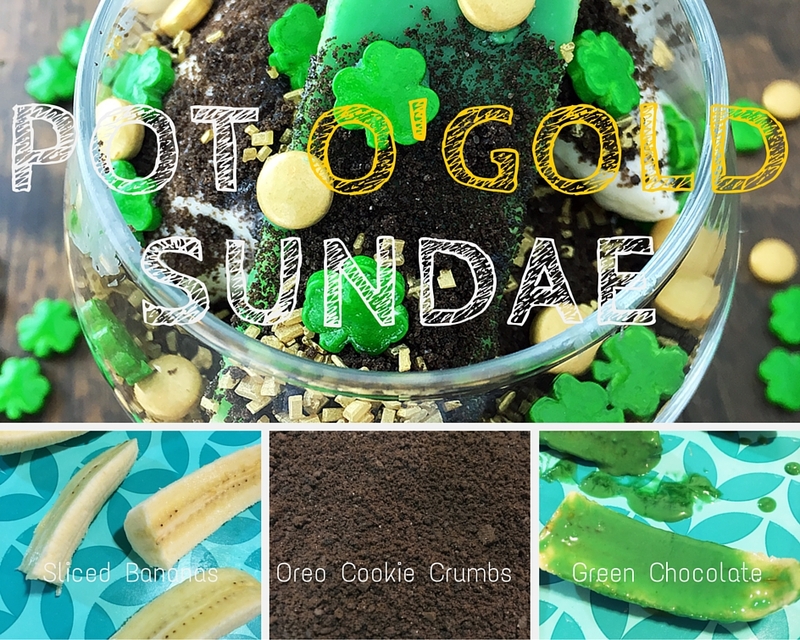 This clever St. Patricks Day Pot O’Gold sundae doesn’t have any cake but it’s dipped with green chocolate and sprinkled with crushed oreo crumbs all combined into a single, perfect spoonful that is sure to bring out the Irish in you! 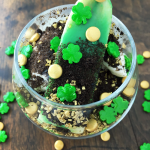 This clever St. Patrick's Day Pot O'Gold Sundae will brink out the Irish in you! Cut banana into 4 parts (first in half, and then down the middle of each half)& place banana slices in the freezer for 15 minutes. Melt candy melts in the microwave at 50% for 30 seconds. Stir. Heat at 50% for another 30 seconds. Stir. Heat at 50% in 15 second intervals and stir until completely smooth. Be careful not to over heat. Remove Bananas from freezer. Slowly pour green candy melts over each banana slice. Place on a cookie sheet and return to freezer for 15 minutes. Remove cream filling from Oreo cookies & crush cookies into fine pieces. Add 3 scoops of ice cream to each sundae. Top with ground Oreo cookies, gold sugar sprinkles and shamrock sugar sprinkle mix. Remove green chocolate covered bananas from freezer. Add 2 slices to each sundae. Garnish bananas with more ground Oreo and sugar sprinkles. If desired, add a tiny bit of green candy melts to secure shamrock sugar sprinkle mix to bananas. Serve immediately! These are super super easy to make and hardly take any time at all! Cut bananas in half and then in half again and place on a tray in freezer for 15 minutes. Remove bananas from the freezer and carefully cover with Melted green chocolate and return them back to freezer for 15 minutes more. Crush Oreos and set aside. Add 3 scoops of your favourite ice cream. Top with ground oreo cookies, gold sugar sprinkles and shamrock sugar sprinkle mix. Garnish with bananas and Enjoy! No matter how you choose to celebrate St. Patrick’s Day, this Pot O’Gold Sundae better make an appearance at some point! This looks delicious! I’ll have to make this with my 6 year old nephew the next time he comes over. He’d love it because of the colors. I did not know (from the picture) that there was a banana hidden in there. I like this recipe even better now. Ice Cream, oreos, and sprinkles — I can’t think of a better treat! I am thinking I will slightly modify it next week for Easter. 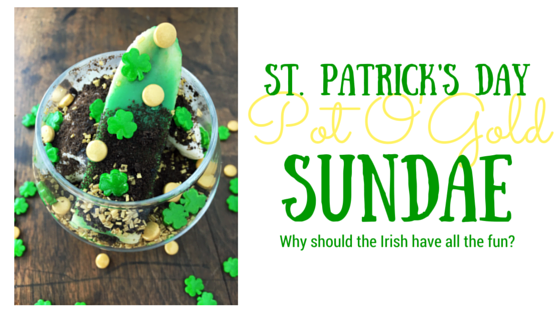 hope you had a lovely st.patricks day – this sundae looks so delicious, bet you enjoyed it!! Oreo cookies are perfect but you have improved their perfection with your recipe. Very creative! I love this! Especially the banana in it! The candy melts from Wilton make this so festive!! 🙂 Pinning for next year! What a fun treat for St. Partick’s Day. I think we have all the stuff to make it, I’ll have to give the kids a special treat later on. How fun! I know a lot of kids that would love this sundae (and adults). It’s so simple which makes it even better. Love the theme of the sundae! Its fun and festive! And how yuumy does it look with all that sugar and candy and chocolate! Yummm…. Oh this looks yummy! I think I would use mint chip ice-cream with the oreos and banana. Yum! These look super cute. A yummy way to celebrate St. Patrick’s Day! These look like a fun idea to do with your kids. But they wouldn’t last long! I grew up in Ireland and absolutely love St Patrick’s Day, I never heard of that pinching thing until I moved to the States though 🙂 Have a great St Paddy’s! This looks so yummy & like such a fun treat for the kiddos! These would be so fun to make for St. Patrick’s Day. My daughter would love these I bet. That’s a fun way to celebrate. I could def. see the kids being happy if I busted these out! This looks yummy! My daughter loves bananas and this would be a fun dessert we could make together. She loves helping me in the kitchen. Oh my gosh, is that a green banana? I love this idea. My kids are going to love this. My kids would think this is super cool! I’m sure they would flip over the green bananas. My kids are suddenly obsessed with St. Patrick’s Day. They will love making their own little pot of gold sundaes! This is adorable. My daughter would have a field day eating this. I might just make this for her. Thanks for the recipe. I love St. Patrick’s Day! And this looks so delicious, I can’t wait to try it! What a cute idea! I’m especially loving that green chocolate! My kids would flip for these! They look so good and the green banana! This looks like so much fun! My kids would absolutely adore this! I am going to have to make it for them! love the banana in it! I’m going to make these for my son!!! I’m looking for some fun, easy things to do or St. Patty’s Day with my kids. this is great! What a super fun and unique sundae idea. I know this would be a hit with my little cousins (since they like to ‘play’ with their food). Yum, candy coated frozen bananas sounds yummy. How can you go wrong with ice cream? I love this clever idea to celebrate St. Patrick’s Day! I love that green banana! I’m going to make these for my kids! I think that is really cool, too! I totally want to make it! this looks delish! and since it has bananas in it I can definitely justify it as one of my five a day :p (only kidding) I need to try this though! What a fun sundae for St Patrick’s Day! I love finding fun seasonal and holiday recipes like this. My kids always loved when I made them. This is such a colorful dessert – my kids would absolutely enjoy it. What a great recipe! Love the name of it! My kids would devour this! That looks like a fun and festive sunday….kids will love it. Ooh, I love St. Patrick’s Day and I love sweet treats even more! This sounds like a fun and yummy recipe. I love your ST Patrick themed sundae before I started blogging I never really saw much about St Patrick’s but bloggers seem to love it. I would serve mine with some special sauce I have not figured out what yet but trust me it will be delicious! YUM!! I’ll be right over for a snack. Who knew green could be so yummy. I must make this. This looks good and so fun! Your recipe sounds like a nice way to celebrate the day without indulging in the alcoholic beverages so many folks enjoy in celebrating St. Patrick’s Day. A nice family-friendly treat that I’ll be sharing with my children on St. Patrick’s Day. I love this! It;s so easy to make and the kids will love it. Heck, my husband and I would love one, too!